In my other life, I’m a scientist. When I say, “my other life,” I don’t mean my life outside the blog; I mean my life in an alternate universe. I do things in a lab that involve other scientists, and also math. I do whatever kind of science I’m interested in at the moment, obviously. Mostly, I work on things that have to do with going into space. You know, it’s rocket science. But sometimes I am in a lab looking into space through a large telescope, or else looking through a microscope at rocks or plants. I may or may not wear a lab coat. I am always taller. Always. In this life, I was in my third year of college before I realized that I was not bad at math or science. In fact, I was borderline good at it. But by the time I figured that out, I had already switched majors too many times (five: drama, communications, drama again, fashion merchandising—don’t ask—and English) to believe that my parents would happily support me through an additional year or two of college because I wanted to switch from English to, say, geology. Alas, I after getting an MA I ended up leaving academia and entering the “real” world as a technical writer, and it was in that job that I realized I should have been a computer science major. But life and finances and reality being what they are, I also realized that was probably not going to happen. 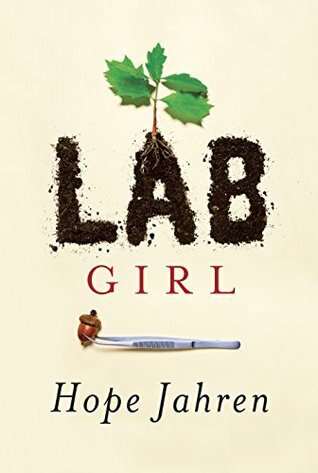 So what does my little sob story have to do with Hope Jahren’s Lab Girl? It’s simple. I’m illustrating how completely unfair it is that I, a former English major and current “content creator,” cannot just wake up one day and decide to “do science”—but Hope Jahren, who spent most of her life in a lab studying plants, can just pick up a pen (or a laptop) and write a really fantastic book. Honestly. Where does she get off? Science has taught me that everything is more complicated than we first assume, and that being able to derive happiness from discovery is a recipe for a beautiful life. It has also convinced me that carefully writing everything down is the only real defense we have against forgetting something more important that once was and is no more, including the spruce tree that should have outlived me but did not. I stood and absorbed this revelation as my life turned a page, and my first scientific discovery shone, as even the cheapest plastic toy does when it is new. Public and private organizations all over the world have studied the mechanics of sexism within science and have concluded that they are complex and multifactorial. In my own small experience, sexism has been something very simple: the cumulative weight of constantly being told that you can’t possibly be what you are. …$7.3 billion sounds like a lot of money. Remember that this figure must support all curiosity-driven science–not just biology, but also geology, chemistry, mathematics, physics, psychology, sociology, and the more esoteric forms of engineering and computer science as well. [Six million dollars for the NSF’s paleobiology program] still sounds like a lot of money. Perhaps we could agree that one paleobiologist from each state in the country should get a grant. If we divide $6 million by fifty, we get $120,000 for each contract. And this is close to the reality: the NSF’s paleobiology program gives out between thirty and forty contracts each year, with an average value of $165,000 each. Thus, at any given time, there are about one hundred funded paleobiologists in America…Note also that there are a lot more than one hundred paleobiology professors in America, which means that most of them can’t do the research they were trained to do. The heart of the book, though, is about her longtime friendship with her lab partner, Bill, who is unconventional, antisocial (er, maybe misanthropic would be a better word), stubborn, humorous, intelligent, and hard-working. In Bill she finds a true (non-romantic) partner to support her work and really, her heart. This part of the book gives it strength by rounding out the story, but it’s also the book’s only real flaw. Most likely Jahren’s preservation instinct is to blame; she’s clearly aware, even in terms of their friendship, of crossing any boundaries that might be too personal or reveal too much. While I appreciate that instinct, about halfway through the book the anecdotes involving her relationship with Bill start to become repetitive. Some of the action drives the story along (i.e., now we are here in this place, researching this new thing), but the exchanges between her and Bill start to seem like a couple of people performing a vaudeville act. I think this is less a function of the writing than the probably very real way they interact, but if you’ve ever spent time with two people who seem to have a shorthand or very particular way of interacting, you know it can be exasperating after a while. The good thing is that it’s very clear that they care for and support each other a great deal, even during the worst of times. Ultimately, I felt like Jahren brought the same passion to her story about science and friendship that Patti Smith brought to her memoir Just Kids. Both books are about a bond, and about discovering a life’s passion (plants on one hand, poetry on the other). “Love and learning are similar in that they can never be wasted,” writes Jahren. Truer words were never spoken. Loulou, thanks for visiting! Maybe the sexism she deals has less to do with being a scientist per se and more to do with being an academic? I remember it was pretty bad, even in the English department. It’s still a boys’ club in a lot of ways. I loved reading about her every discovery. Her persistence, dedication, and joy all shine through…I hope she decides to write another book. I am an academic, but a lot of researchers in my field are current or former nurses, which means the workforce is much less of a boys’ club. Our office is quite fun, because we have a huge mixture of people from lots of different backgrounds, both academic and other. I notice the boys’ club aspect way more at conferences, and I realise it’s lots worse in many departments than in my own. I also hope she decides to write another book! She’s an extraordinary writer. I was also so impressed with her writing. And it was more personal than I thought it would be, which I loved. Ooh, oh, I want to play too! In my other life, I think I’m a sound technician or a sound editor. That always sounds like such a satisfying job, I think I could totally have done it if I’d known it was a thing and taken classes at the relevant time. Terrific review! I am looking forward to reading this someday. Naomi, I thought she had just the right mix. On the personal side, I wanted to know a bit more about her family, and why she seemed estranged. I suppose she didn’t include that due to privacy, which I certainly respect given how many writers of memoirs seem to bleed across the page, but I did feel like that was one (small) thing that was missing. Jenny, how fun! Maybe you still could? Never say never? It’s fun to think about, either way. Care, it’s well worth the time! I heard her in an interview on NPR, and she discussed the challenges she faced while writing the book. For instance, scientists would write to her to tell her she got the science of something wrong. However, she defended the way she wrote the book because it is meant for any reader, not just scientists, so leaving out some of the specificity makes it more accessible, even if the science terms are just a teeny, tiny bit less accurate. Sounds like you liked this book as much as I did. In that case I think you’ll love two books by another woman scientist, Robin Wall Kimmerer. She wrote Gathering Moss and Braiding Sweetgrass. She is a Native American, and a writer who has a wonderful way of making connections. Read Braiding Sweetgrass first, even though it’s her second book. Elizabeth Gilbert consulted with her before writing The Signature of All Things (which I wasn’t all that crazy about).